(Francisco Kjolseth | The Salt Lake Tribune) Marci Richards, 73, of Milwaukee, Wisconsin takes to the ice for a practice session as she gets ready to compete in the 2019 U.S. Adult Figure Skating Championships, now in its 25th year, being held at the SLC Sports Complex. Richards who started skating to recover following a skiing accident has competed in 18 Adult Nationals and loves to skate. Over 600 skaters between 21 and 80 will compete April 3-6. (Francisco Kjolseth | The Salt Lake Tribune) Marci Richards, 73, of Milwaukee, Wisconsin cools down following a practice session as she gets ready to compete in the 2019 U.S. Adult Figure Skating Championships, now in its 25th year, being held at the SLC Sports Complex. Richards who started skating to recover following a skiing accident has competed in 18 Adult Nationals and loves to skate. Over 600 skaters between 21 and 80 will compete April 3-6. 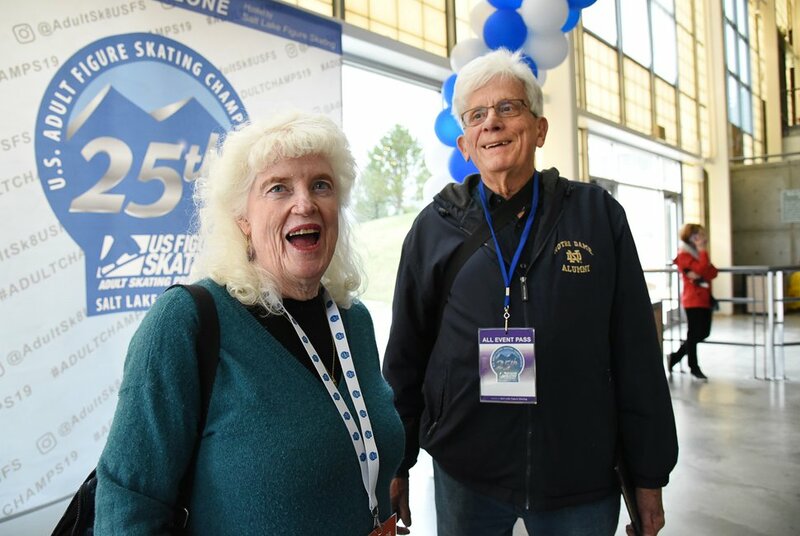 (Francisco Kjolseth | The Salt Lake Tribune) Glen and Diane Gleving, both 65, from Minnesota talk about their love for skating while cooling down following a practice session to work on their couples routine on Wed. April 3, 2019. The pair are just some of the more senior skaters participating in the 2019 U.S. Adult Figure Skating Championships, now in its 25th year, being held at the SLC Sports Complex. Over 600 skaters between 21 and 80 will compete April 3-6. (Francisco Kjolseth | The Salt Lake Tribune) Glen and Diane Gleving, both 65, from Minnesota glide along the ice as they put in a practice session to work on their couples routine on Wed. April 3, 2019. The couple started skating together in their late 30's and find it to be a great de-stressor. The pair are just some of the more senior skaters participating in the 2019 U.S. Adult Figure Skating Championships, now in its 25th year, being held at the SLC Sports Complex. Over 600 skaters between 21 and 80 will compete April 3-6. (Francisco Kjolseth | The Salt Lake Tribune) Glen and Diane Gleving, both 65, from Minnesota glide along the ice as they put in a practice session to work on their couples routine on Wed. April 3, 2019. The couple started skating together in their late 30's and find it to be a great de-stressor. The pair are just some of the more senior skaters participating in the 2019 U.S. Adult Figure Skating Championships, now in its 25th year, being held at the SLC Sports Complex. Over 600 skaters between 21 and 80 will compete April 3-6. (Francisco Kjolseth | The Salt Lake Tribune) Barb Foley, 71, of Orland Park, gets ready to hit the ice for a practice session as part of the 2019 U.S. Adult Figure Skating Championships, now in its 25th year, being held at the SLC Sports Complex. Over 600 skaters between 21 and 80 will compete April 3-6. (Francisco Kjolseth | The Salt Lake Tribune) Barb Foley, 71, of Orland Park, Illinois warms up on the ice as part of the 2019 U.S. Adult Figure Skating Championships, now in its 25th year, being held at the SLC Sports Complex. Over 600 skaters between 21 and 80 will compete April 3-6. (Francisco Kjolseth | The Salt Lake Tribune) Barb Foley, 71, of Orland Park, Illinois warms up on the ice as part of the 2019 U.S. Adult Figure Skating Championships, now in its 25th year, being held at the SLC Sports Complex. Over 600 skaters between 21 and 80 will compete April 3-6. (Francisco Kjolseth | The Salt Lake Tribune) Barb Foley, 71, of Orland Park, Illinois takes a break from practice as part of the 2019 U.S. Adult Figure Skating Championships, now in its 25th year, being held at the SLC Sports Complex. Over 600 skaters between 21 and 80 will compete April 3-6. (Francisco Kjolseth | The Salt Lake Tribune) Beth Putnam, 69, of Daytona Beach, FL, a bronze class 5 skater takes the time to stretch before a practice session as she gets ready to compete in the 2019 U.S. Adult Figure Skating Championships, now in its 25th year, being held at the SLC Sports Complex. Over 600 skaters between 21 and 80 will compete April 3-6. (Francisco Kjolseth | The Salt Lake Tribune) Beth Putnam, 69, of Daytona Beach, FL, a bronze class 5 skater takes to the ice for a practice session as she gets ready to compete in the 2019 U.S. Adult Figure Skating Championships, now in its 25th year, being held at the SLC Sports Complex. Over 600 skaters between 21 and 80 will compete April 3-6. 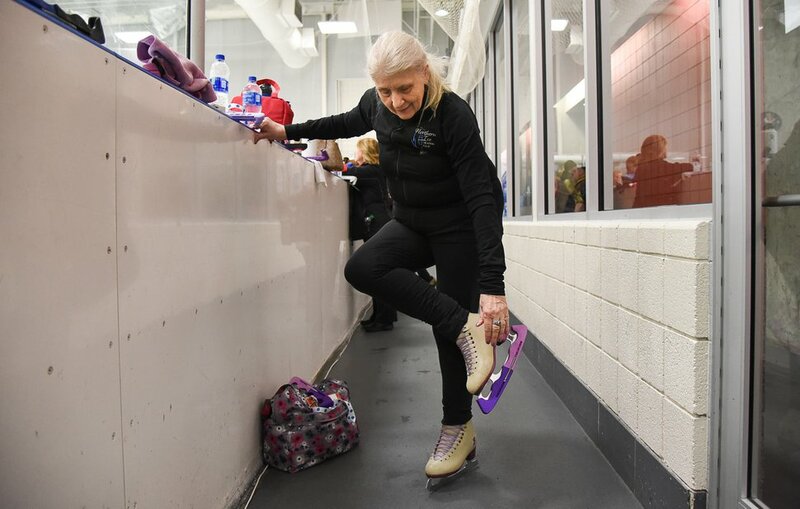 (Francisco Kjolseth | The Salt Lake Tribune) Beth Putnam, 69, of Daytona Beach, FL, a bronze class 5 skater takes to the ice for a practice session as she gets ready to compete in the 2019 U.S. Adult Figure Skating Championships, now in its 25th year, being held at the SLC Sports Complex. Over 600 skaters between 21 and 80 will compete April 3-6. 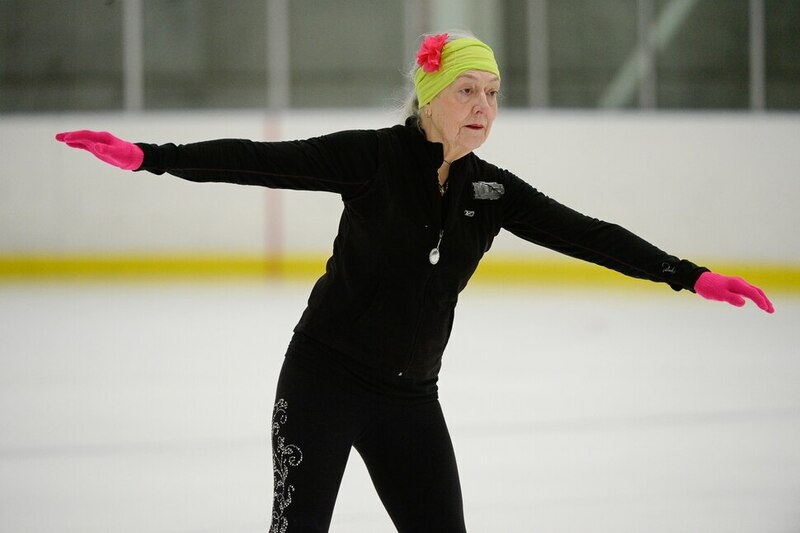 (Francisco Kjolseth | The Salt Lake Tribune) Beth Putnam, 69, of Daytona Beach, FL, a bronze class 5 skater takes to the ice for a practice session as she gets ready to compete in the 2019 U.S. Adult Figure Skating Championships, now in its 25th year, being held at the SLC Sports Complex. Over 600 skaters between 21 and 80 will compete April 3-6. (Francisco Kjolseth | The Salt Lake Tribune) Marci Richards, 73, of Milwaukee, Wisconsin takes to the ice for a practice session as she gets ready to compete in the 2019 U.S. Adult Figure Skating Championships, now in its 25th year, being held at the SLC Sports Complex. Richards who started skating to recover following a skiing accident has competed in 18 Adult Nationals and loves to skate. Over 600 skaters between 21 and 80 will compete April 3-6. 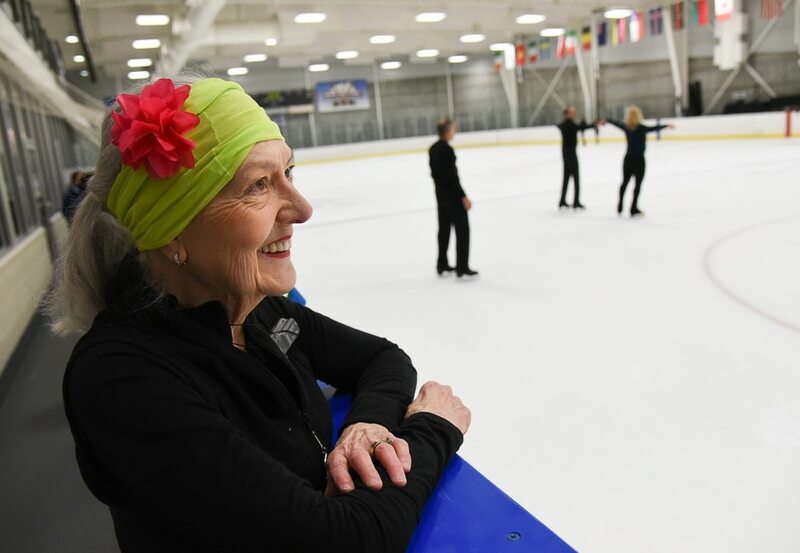 (Francisco Kjolseth | The Salt Lake Tribune) Beth Putnam, 69, of Daytona Beach, FL, a bronze class 5 skater takes to the ice for a practice session as she gets ready to compete in the 2019 U.S. Adult Figure Skating Championships, now in its 25th year, being held at the SLC Sports Complex. Over 600 skaters between 21 and 80 will compete April 3-6. (Francisco Kjolseth | The Salt Lake Tribune) Marci Richards, 73, of Milwaukee, Wisconsin takes to the ice for a practice session as she gets ready to compete in the 2019 U.S. Adult Figure Skating Championships, now in its 25th year, being held at the SLC Sports Complex. Richards who started skating to recover following a skiing accident has competed in 18 Adult Nationals and loves to skate. Over 600 skaters between 21 and 80 will compete April 3-6. (Francisco Kjolseth | The Salt Lake Tribune) Marci Richards, 73, of Milwaukee, Wisconsin takes to the ice for a practice session as she gets ready to compete in the 2019 U.S. Adult Figure Skating Championships, now in its 25th year, being held at the SLC Sports Complex. Richards who started skating to recover following a skiing accident has competed in 18 Adult Nationals and loves to skate. Over 600 skaters between 21 and 80 will compete April 3-6. (Francisco Kjolseth | The Salt Lake Tribune) Barb Foley, 71, of Orland Park, Illinois warms up on the ice as part of the 2019 U.S. Adult Figure Skating Championships, now in its 25th year, being held at the SLC Sports Complex. Over 600 skaters between 21 and 80 will compete April 3-6. (Francisco Kjolseth | The Salt Lake Tribune) Marci Richards, 73, of Milwaukee, Wisconsin takes to the ice for a practice session as she gets ready to compete in the 2019 U.S. Adult Figure Skating Championships, now in its 25th year, being held at the SLC Sports Complex. Richards who started skating to recover following a skiing accident has competed in 18 Adult Nationals and loves to skate. Over 600 skaters between 21 and 80 will compete April 3-6. (Francisco Kjolseth | The Salt Lake Tribune) Connie Curry, 80, alongside her husband Tom Larence, 78, is the most senior skater participating in the 2019 U.S. Adult Figure Skating Championships, now in its 25th year, being held at the SLC Sports Complex. Connie who is scheduled to be part of the opening ceremonies says she started skating at the age of 60 when her father at the age of 95 asked her is she had any regrets. Learning how to ice skate was her response after some thought and she has never turned back. Though she doesn't skate with Tom they do like to play Bluegrass together with Tom on an upright base and Connie playing the banjo. Over 600 skaters between 21 and 80 will compete April 3-6. (Francisco Kjolseth | The Salt Lake Tribune) Marci Richards, 73, of Milwaukee, Wisconsin takes to the ice for a practice session as she gets ready to compete in the 2019 U.S. Adult Figure Skating Championships, now in its 25th year, being held at the SLC Sports Complex. Richards who started skating to recover following a skiing accident has competed in 18 Adult Nationals and loves to skate. Over 600 skaters between 21 and 80 will compete April 3-6. A neon green headband with a fuchsia bow and matching hot pink gloves made figure skater Marci Richards easy to spot as she glided across the ice at the Salt Lake City Sports Complex. But Richards, a part-time Utah resident and Milwaukee native, stood out for another reason: At 73, she is a “super-ager,” defying stereotypes in a sport usually reserved for youngsters. Richards is one of 30 competitors in the 66-and-older division at the U.S. Adult Figure Skating Championships, being held this week. The competition — which attracted nearly 400 participants ages 21 to 80 — provides adult skaters an opportunity to compete among their peers, said Lexi Rohner, who lives in the Salt Lake City area and is the national vice chairwoman for adult skating competitions. Rohner said some of the skaters have competed on the national and international levels in their youth — but want to continue in the sport as adults — while others picked it up later in life for heath reasons or just for fun. Ice skating is a low-impact, aerobic workout that helps with balance. For the four-day event, that continues through Saturday at the Salt Lake City Sports Complex, 645 S. Guardsman Way, competitors are divided into five age groups, with the youngest being 21-35 and the oldest 66-plus — all age brackets have two ability tracks (masters and adults). Skaters compete in the traditional singles, pairs and ice dance categories, as well as dramatic entertainment and light entertainment divisions. In the two latter categories, skaters usually forgo the athletic jumps and spins, and instead showcase their personality with music, props and costumes. (Francisco Kjolseth | The Salt Lake Tribune) Barb Foley, 71, of Orland Park, gets ready to hit the ice for a practice session as part of the 2019 U.S. Adult Figure Skating Championships, now in its 25th year, being held at the SLC Sports Complex. Over 600 skaters between 21 and 80 will compete April 3-6. On Friday and Saturday, the public can watch the competition that continues all day until 9 p.m. Tickets are available at the door for $15 per person. Discounts are available for veterans and seniors; children 6 and under are free. Nathan Chen, the two-time and reigning World Champion, Olympian and Salt Lake City native, will also make an appearance Saturday. Since the competition began in 1993, the adult championships have involved nearly 11,000 competitors, including 637 in the 66 and over category, Rohner said. Seven skaters at this year’s event have competed in all 25 competitions. Reuniting with the same skaters year after year and developing friendships is the best part of the event for some. (Francisco Kjolseth | The Salt Lake Tribune) Connie Curry, 80, alongside her husband Tom Larence, 78, is the most senior skater participating in the 2019 U.S. Adult Figure Skating Championships, now in its 25th year, being held at the SLC Sports Complex. Connie who is scheduled to be part of the opening ceremonies says she started skating at the age of 60 when her father at the age of 95 asked her is she had any regrets. Learning how to ice skate was her response after some thought and she has never turned back. Though she doesn't skate with Tom they do like to play Bluegrass together with Tom on an upright base and Connie playing the banjo. Over 600 skaters between 21 and 80 will compete April 3-6. This will be the third time San Jose resident Connie Curry — who, at 80, is the oldest competitor — has participated. Curry was 60 when she bought her first pair of skates and signed up for a group lesson. She now practices four times a week, sometimes three hours a day. Her coach is Canadian ice dancer John Dowding. He, along with his partner, Lorna Wighton, won the Canadian Figure Skating Championships three times in the late 1970s. “I feel like I’m blazing a trail for everyone behind me,” said Curry, who will receive the Yvonne M. Dowlen Trophy for being the oldest competitor. All athletes 71 and older will receive the Skate Forever Young Award. Curry — who also started playing banjo at 73 — said when she was growing up, organized sports were nonexistent for girls. “We didn’t have the opportunities they do now," she said. Indeed, Title IX was still years from being enacted.